Nobody really knows how to “make it” as a writer, especially when the only advice that people ever give just amounts to suggesting that you keep at it, and eventually things will either work out or you’ll die miserable. (Not that you won’t die miserable even if you become a writer, but it’s a different kind of miserable.) That goes double for Hollywood, where countless really good scripts and ideas go wasted every year in favor of another crowd-pleasing superhero movie or powerful indie drama, leaving undiscovered writers with nowhere to turn. The trick is that this works both ways, and nobody knows which wacky stunts will actually get attention from one of the big studios, so sometimes you just have to go for broke and buy a full-page ad in The Hollywood Reporter to try and pitch your idea for a Die Hard sequel. That may sound like a very specific example, but that’s because an independent film writer and producer named Eric D. Wilkinson literally just did that exact thing. Wilkinson’s ad was noticed by people on Twitter, and it’s framed as an open letter to Bruce Willis, Lorenzo di Bonaventura, and Len Wiseman. 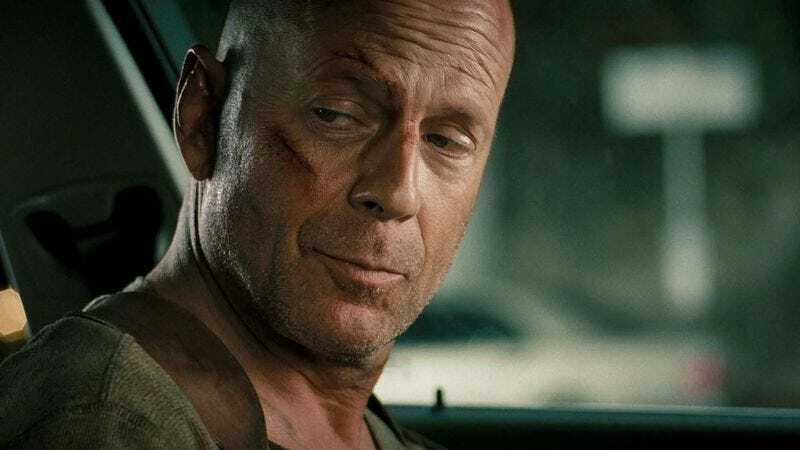 In it, Wilkinson explains that he’s a huge Die Hard fan, and when he heard about the plans to make the next sequel an origin story for John McClane, he wanted to come up with an idea for how to make that work. That idea is officially titled Die Hard: Year One, and rather than make you read the whole ad, we’ll just give you a synopsis here: It opens with a 60-year-old McClane being shipped off to a federal prison for reasons the audience doesn’t know yet. It then flashes back to the ‘70s, where young McClane is investigating the murder of a little boy. Because of his propensity for breaking the rules, McClane accidentally lets his only suspect get away, and the trail goes cold. Fast forward 34 years, and while McClane is in Russia during the events of A Good Day To Die Hard, the body of that suspect is discovered along with DNA evidence pointing to—dun dun dun—John McClane. Assuming you’re a film producer or Bruce Willis, Wilkinson included a phone number and e-mail address where he can be reached. Sadly, he did not include a street address where a truck full of money could be delivered to him, but he’ll probably give you one if you call.